Picture quality is not the composition, exposure, or other traditional characteristics of the photographs you take with your Nikon D3100, D5100 or D7000. It’s how finely the image is rendered in the digital sense. JPEG artifacts: The “parquet tile” texture and random color defects that mar the third image can occur in photos captured in the JPEG (jay-peg) file format, which is why these flaws are referred to as JPEG artifacts. This is the defect related to the Image Quality setting. 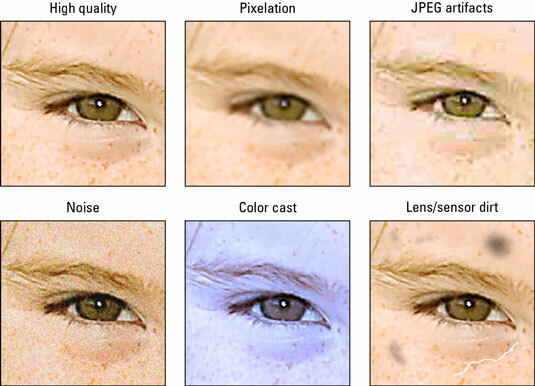 Noise: This defect gives your image a speckled look. Noise can occur with very long exposure times or when you choose a high ISO Sensitivity setting on your camera. The D5100 and D7000 offer an automated, internal sensor-cleaning mechanism. By default, this automatic cleaning happens every time you turn the camera on or off. You also can request a cleaning session at any time via the Clean Image Sensor command on the Setup menu. But if you have a D3100 or frequently change lenses in a dirty environment, a manual sensor cleaning is necessary. Image sensors are pretty delicate beings, and you can easily damage them or other parts of your camera if you aren’t careful. Instead, find a local camera store that offers this service.